Home › News › Michelle’s Mice Strike Gold! The image left, entitled “Three’s a Crowd”, was entered into the Tramonta 2018 FIAP International Salon, Montenegro where it received a score of 26 and was awarded a Victory P.W. Gold medal! I was quite surprised, as although I thought it was a good image it had not been accepted into the BPE Salon at Shrewsbury a few days earlier! To say I’m quite chuffed would be an understatement as I’ve not won any medals before. 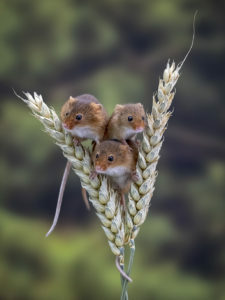 This was one of hundreds of Harvest Mice images I took on a recent Macro workshop. I’m still editing the rest! Well done Michelle and it just goes to show that getting knocked back by one judge shouldn’t stop you – the next judge may think you’re brilliant. I’m sure we’ll see more of the mice in the next few contests.